Amber Neben, World-Class Athlete-Cyclist and Author of "When Schmack Happens, The Making of a Spiritual Champion". Those plans included graduating from Lutheran High School of Orange County where Amber was a very successful student and teammate for the soccer, track and cross country teams. It was during the last two years of Amber’s high school running career that stress fractures began to take a toll. Those stress fractures followed Amber to the University of Nebraska in Lincoln where she attended on a track and field scholarship. At the University of Nebraska, Amber was forced to redshirt her freshman season because the stress fractures returned while she was training for the fall season. “I was motivated, though. Deep down inside, I knew I had a unique talent. God had blessed me with ‘a good plumbing system’ and a desire to compete. I knew I was an athlete. However, I kept getting hurt. Why? Why couldn’t I use this talent?” Sophomore year had Amber competing with the team again and achieving the award of “Comeback Athlete of the Year.” At the end of the season, Amber went for a run and realized the stress fractures were back, but now in her femurs as well as her shins. Amber finished her last two years, class of 1997, as an undergraduate assistant coach with the passion and fire to do more as an athlete. With a Bachelor’s Degree in Biology, Amber returned home to southern California and married Jason Neben, who is currently an Assistant Professor of Education at Concordia University Irvine. Amber enrolled at the University of California and began to pursue a PhD in Molecular Biology, Genetics and Biochemistry. Amber would ride on the lifecycle while she was reading papers and textbooks. For fun, she met some family friends who took her mountain biking. In the fall of 1998, Amber raced in the collegiate national championships. Her top ten finish led to the beginning of her cycling career and the meeting of her then and current coach Dave Jordaan. In 2000, Amber rose through the ranks to be a professional mountain biker. During 2001, Amber raced in mountain races and road races, being successful in both. “I was chewing on two decisions: road vs. dirt and cycling vs. graduate school. In August I decided to turn my focus to the road. I also made the decision to stop my PhD work, take a Masters degree, and focus on cycling.” Two years later, riding with the T-Mobile Professional Women’s Team, Amber was the U.S. National Champion in road cycling. Her decision to race professionally has taken her all over the world, especially when she joined Dutchbased Team Flexpoint in 2005. 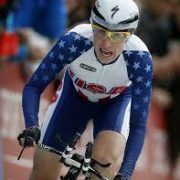 She has won major races in the United States and abroad including back to back wins in the Tour de l’Aude Feminin (women’s equivalent of the Tour de France) in 2005 and 2006. Amber’s faith and trust in the Lord has been the foundation of her personal and professional career. She relied upon God’s healing hand as she faced another challenge in the fall of 2007 when she was diagnosed with melanoma, a potentially deadly form of skin cancer. “I have had a number of challenges along the path of my athletic career. I certainly have not understood all of them; however, I have never doubted that the Lord would bring something positive out of each, and this is no different. I have also never doubted that He has got me in His arms, and I certainly feel that peace now.” The melanoma was successfully removed and Amber has experienced a full recovery, with no recurrences to date. The summer of 2008 was a dream come true as Amber competed for the U.S.A. at the Olympics in Beijing, China. While the race itself turned out to be a disappointment due to a bike mechanical problem, the experience of the opening ceremonies, meeting other Olympic athletes and representing her country was unlike any other. Who would of thought it could get any better? Well, it took just six weeks following the Games in Beijing. On September 24, 2008, Amber became a World Champion as she rode to victory in the Time Trial at the 2008 World Championships in Varese, Italy. The years following would be some of the most challenging as cycling crashes, broken bones, visits to foreign country ERs, successful surgeries, and rehabbing injuries ocurred in 2009, 2010, and 2011. Each required a focused resolve to return to the highest level of competition. In 2012, Amber was once again selected to represent Team USA at the Olympics, this time in London. To cap off the comeback from the previous years setbacks she finished on the top step of the podium at the World Championships with a win in the Team Time Trial. With an injury free year of racing back under her belt 2013 promised to be an exciting year. It was exciting, all right, but not as hoped. 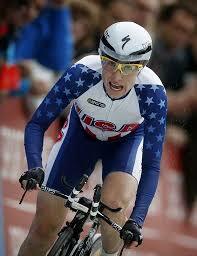 A serious crash at the Tour of California Time Trial mid year left Amber with a broken hip, ribs, and nose. Amber used this experience as the catalyst for writing a book. The next few months, while recovering from the crash, she penned her first book. When Shmack Happens chronicles her response to adversity both on and off the bike, and how her experiences have served to mature her faith in Christ. As 2014 begins, Amber is back on the bike with a renewed spirit. https://www.globalbusinessnews.net/wp-content/uploads/2014/06/Amber-Neben-on-Cycle.jpg 256 197 Ed https://www.globalbusinessnews.net/wp-content/uploads/2019/04/New-GBH-4-24-2019-1202x167.jpg Ed2014-06-28 18:47:172016-12-06 19:06:16Amber Neben, World-Class Athlete-Cyclist and Author of "When Schmack Happens, The Making of a Spiritual Champion".